The history of falconry around the world. The practice of falconry goes back some 4000 to 6000 years BC originating in East Asia on the steppes of Mongolia or possibly in the Persian Gulf region of the Middle East where it was well established by 2000 BC. Falconry was originally used as a means of sustenance and has been practiced in many forms by many cultures around the world. 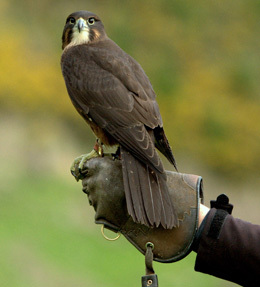 From the 6th Century through the Middle Ages falconry’s popularity surged. It was the sport of royalty for centuries with the possession of birds of prey considered a status symbol. For example, in 17th Century England falconry was governed by a strict set of customs that dictated the birds of prey allowed to be flown by people of various social ranks. For instance only a king was allowed to fly the largest and most magnificent of falcons, the Gyr falcon, while only a prince could fly a female peregrine (known simply as ‘a falcon’ in falconry terminology; noblewomen could only fly a Merlin and knaves, servants or children could only fly a Eurasian Kestrel. By the 1800s the sport began to diminish due to the invention and increased use of firearms to obtain food. However, by the turn of the 20th century interest in falconry began to rise again. Today about 80 countries worldwide practice falconry, and in 2010 in recognition of its long cultural history, falconry was inscribed as a living human heritage on the UNESCO Representative List of Intangible Cultural Heritage of Humanity. The history of falconry in New Zealand. There is no known evidence of Maori using birds of prey for hunting prior to the arrival of Europeans. However, records show that falconry has been practiced in New Zealand now for some 100 years. 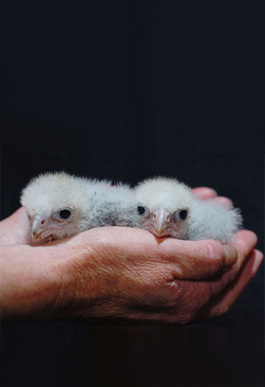 The Raptor Association of New Zealand was established in the 1970’s with the aim of supporting research, rehabilitation and falconry. At that time harriers were an unprotected species and were available to falconers without the need for a permit from the then New Zealand Wildlife Service. 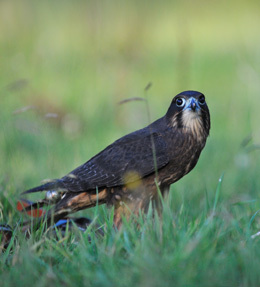 The founding meeting of the Raptor Association was a falconry group meeting in the Waihopai Valley in Marlborough, where falconers hunted with their birds. Harriers became partially protected in 1985 and as such could not be held without a permit under the Wildlife Act (1953). Despite permits being issued for harrier destruction, when they were perceived to be causing economic or other harm, the passion of a core group of falconers did not waiver. Then in 2010 with the rescheduling of the harrier in the Wildlife Act, the first permits for legal falconry with harriers in New Zealand were issued by the Department of Conservation. Wingspan has and continues to work closely with DOC to make sure that suitable guidelines and policies are implemented and enforced to ensure the responsible management and welfare of all the birds used in falconry in New Zealand. Wingspan is a member of The International Association of Falconry and has represented the falconers of New Zealand at multiple International Festivals of Falconry. In 2011 The New Zealand Falconers Association (NZFA) was established to support and ensure the longevity and responsible practice of falconry in New Zealand. The NZFA’s inaugural meeting was held at the International Festival of Falconry in Al Ain, UAE a fitting location if ever there was one!